Mitch Muenster on Xamarin, Microsoft, & other tech/software I can get my hands on. 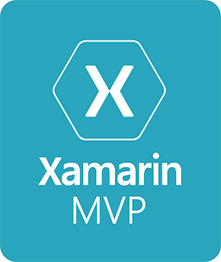 dubbed Xamarin 4. Their solution to this once plaguing Issue? 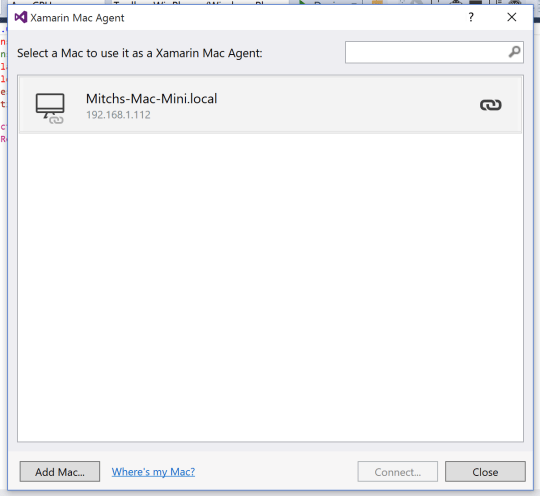 Xamarin Mac Agent. Above: The Toolbox and Banana Finder solutions are connected to the mac at the same time! 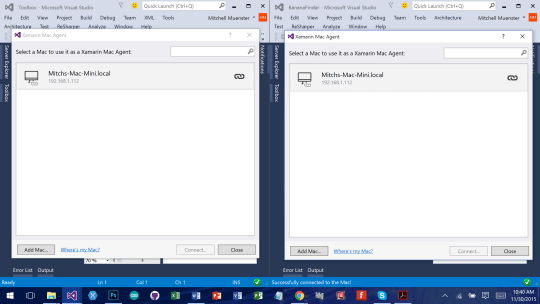 Above: a photo of just how clean and clear the new Xamarin Mac Agent is to the developer. learn more about how to integrate TC into my projects. out by adding a UITest Project to my app in Xamarin Studio. a new project. Click on “Tests” in the Cross-Platform Section. .AppBundle (“../../../iOS/bin/iPhoneSumulator/debug/XamarinForms.iOS.app”) ” as an example for iOS. You may have to edit the path to match your environment and avoid and issues along the way and allowing your project to be seen and built. The Test.cs is where the UITests will be stored and run. You can test for many things in your code from simply “How does it look” to walking through every strep a user would take while using the app. While I recommend looking at the API for the full list of functionality that you can do with UITesting, You can use it to check more complex things like Scrolling Strategy, Change the GPS of the device to simulate physical movement happening, and even the ability to query certain view elements to make a match. Once your test is built and to your liking, you are ready to move on to getting it deployed to test cloud. 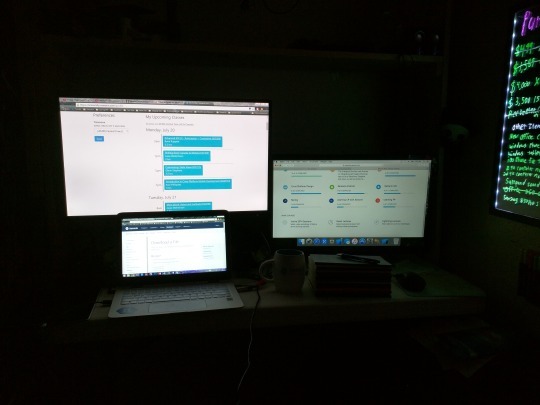 For this blog post, I chose to use Xamarin Studio on iOS and deploy to Xamarin test cloud with an iOS app to test with. However if you are more comfortable in the command line, you can deploy it to test cloud from there. You can also deploy to Test Cloud via Calabash which runs in ruby. They both have their own ways to write tests and push code, so use what you are most comfortable with. To deploy to Test Cloud from Xamarin Studio, you must first must go into the Unit Tests tab on the right hand side of Xamarin Studio. If you do not see it there, you can get to it from the top navigation menu of OSX and go to View -> Sketch (also found by View->Pads->Unit Tests). Once you are there, Ctrl + Click on Test Apps (You can find it by looking for a blue circle with the play symbol inside of it) and choose “Add App Project”. You should see a window pop up that has a list of your projects on it. This shows a list of all compatible project types. Select the projects you wish to deploy to test cloud. (In this case it would be only iOS as that is what I am doing in the demo, however checking both or just android will not affect your results. Once you have selected the projects you wish to run, click okay and you will see that the projects are now listed with info about what target, os, device type it is set to. Once your project is added to the test list, you can Ctrl + Click on your UI test project (if you are following my naming convention form earlier you would be looking for the one that is .UITest) and chose deploy to test cloud. If you have not already done so, you may want to go to the test cloud site and get your app set up. NOTE: This is where I got stuck and had to do some research. When I would try to build, it kept failing saying that it could not find my .ipa file. Make sure you Xamarin Studio is set to Debug (nothing after it) and navigate to your [iOS Proj]/Bin/Debug/ folder and look to see if it was there. If not you have to do a build to get it to work. With me, I had done a build but it named the project LoginWithMasterDetailiOS.10.ipa making XS not able to find it. Once you have successfully built the ios app. rename the .ipa file to not have that 10 in the name and you should successfully build. And that’s it. The rest is rather strait forward, following the steps, choosing what devices and waiting for it to run. Happy Testing! service you want, but here are some reasons you would want to. 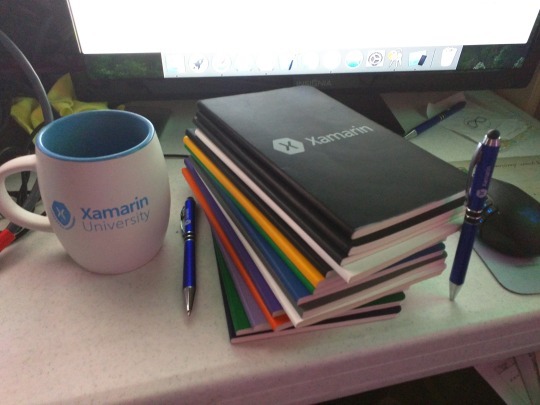 the Xamarin team has been hard at work to develop. Phone Gap app UI Testing. 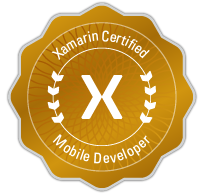 Xamarin University, Certification Studying, and More! Greetings from the Developer Cave! help those who have yet to. as all good places that I am using to help me study. 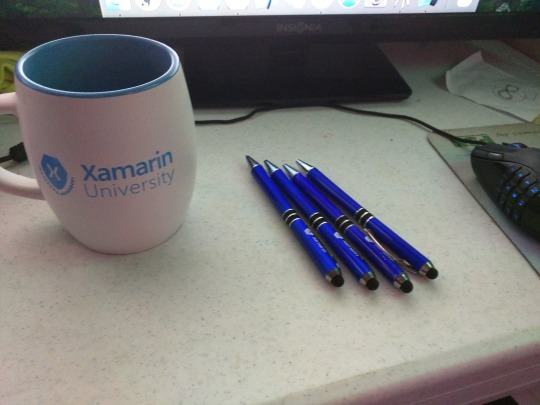 Author Mitch MuensterPosted on July 20, 2015 Categories XamarinTags Xamarin, xamarin certification, xamarin universityLeave a comment on Xamarin University, Certification Studying, and More!